VINEYARD ESTATE with attention to detail and custom woodwork like no other home on the Central Coast. 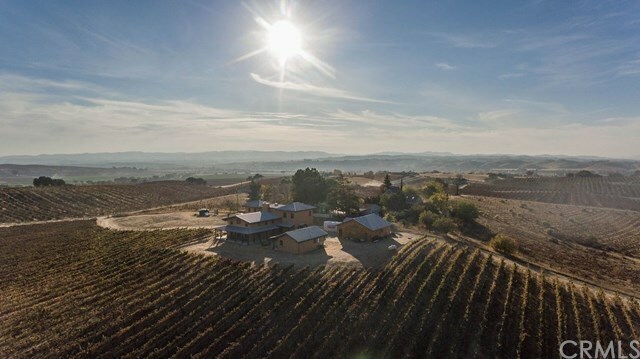 This approximately 10-acre property features around 8 acres of established vineyard, with a completely custom 3,000 +/- sq. ft. home, a detached 2 bedroom/1 bath guest unit and a detached 2 car garage. The main home features a stunning open floor plan. An open beam design flows through the dining area, kitchen and past the fireplace into the great room. Double doors from the great room open to the wrap-around porch, with gorgeous views of your personal vineyard. The entire downstairs has a unique Bourbon Street style belt-driven fan system. The kitchen, island, doors and other features, are luxuriously and expertly trimmed in vintage oak. Even the modern refrigerator and dishwasher are hidden behind vintage oak fronts. No detail is missed - from the professional Wolf range to the custom oak dining table - this is a kitchen for the most discerning of cooks. The second floor boosts a master suite and guest suite, each with their own private full bathrooms, and a fabulous view of the surrounding vineyards. The master bath features a free-standing tub, plus walk-in shower, dual sinks and sauna. From the superb craftsmanship of the oak trim, to the interlocking beam joints and southwestern flare, this is a truly unique home â like no other you have seen. The mature vineyard is comprised of 2 +/- acres of Petite Sirah and 6 +/- acres of Zin, currently modestly locally managed. Directions: Union to North River, Left on River, Right on Magdalena (next right past Estrella Rd.). Property LHS.